i bought same lens from ebay and am wondering if there is a way to use thsi lense with a canon powershot a610 digital camera? I am afraid I don't have the answer for you. The lens is in Pentax K mount and I am not aware of an adapter that will fit a point & shoot camera as in your Canon A610. You better go back to your sources which claim that a Pentax K mount lens can work with your Canon camera. I seriously doubt that they will work together. For some older M42 lens, there are adapters to work with some Canon SLR/dSLR mount but I don't know enough to say for sure. 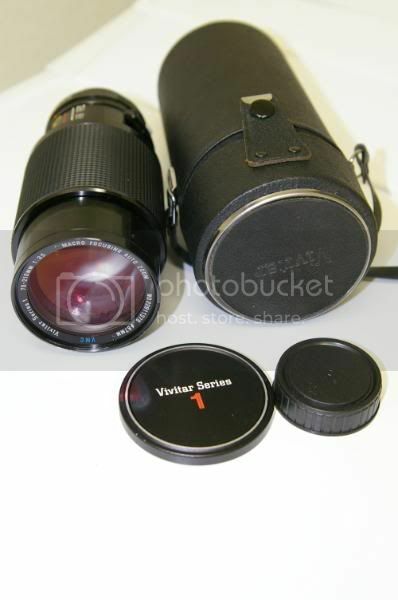 I just got a vivitar 70-210 with a p/k inscribed in it but can't seem to fit my k10D, any ideas? I've got this exact lens in Minolta mount and it's absolutely my favourite lens out of my kit. Sure it's heavy but that didn't stop me from taking it everywhere with me on a trip to India this summer. The images were worth it. I just got this lens in a Canon FD mount for $10.50 + $12 shipping; wow, a fantastic lens, no one else bid on it. Perfect addition to my AE-1P kit. Just addding a hod & filter will increase the cost tenfold! Does anyone know if there is a lens hood for the Vivitar 70mm-210mm f/3.5 Series 1 (version 1, Kiron, 67mm filter size) out there that was actually made for this lens? If so, where can I go to find one? There was an official Vivitar lens hood, I have one. It doesn't seem to be anything special, it's just a collapsible round rubber shade which clamps onto the filter ring. It has no filter threads of its own and doesn't allow the use of the original lens cap either so it's a bit of a functional frustration. Honestly unless you're hung up on having the "Vivitar" name moulded into the rubber I would just use a regular 67mm prime hood.